Let’s face it, of all the ancient creatures who roamed the earth, what were more straight-out awesome than the thunder-lizards themselves – the dinosaurs? Okay, [I]Jurassic Park[/I] warned us all, but as long as scientists developed some ‘dino-muzzles’ for the beasts to prevent them gorging on humanity, there really would be no problems associated with reviving T-Rex and his gang. Honestly, what could be cooler than riding a Triceratops to work each morning? Or playing fetch with a velociraptor? Recently I was personally horrified when I stumbled upon an episode of the new[I] Thomas the Tank Engine[/I]. Shockingly, my beloved childhood show had gone all Toy Story and the charming little model trains were replaced with hideous collections of rendered polygons and the Bidirectional Reflectance Distribution Function. How fun. It appears the microchip has buried the faux-real magic of stop motion animation. No more quirky, thumb-printed claymation characters for kids these days, it’s all down to complex equations and the power of the processor. Where’s the magic in that? (Geeks, be quiet). These days it’s too easy to make a music compilation. In fact, most programs do it for you. Back in the day, there were no 10,000 song auto-playlists named “sUMmah Mixz <3’ – no, if you wanted a collection of your favourite songs, you had to wait patiently for them to be played on the radio and pounce like a starving lion on the record button as soon as the announcer shut the hell up. You’d only get about 60 or 90 minutes per tape (double-sided baby! ), and often the cassette would malfunction and try to strangle you with metres of surprisingly tough magnetic tape – but the effort and risks meant each mixtape was a genuine validation of your love of music. I’ll take off my jaded-hipster trilby now. Forget the paranoid spectre of terrorism, your code reds, your invasive airport security checks and your fuzzy newsreels of bearded men running through obstacle courses – if we have to be scared of something, it might as well be Vikings. There’d be no suspicious glances over your neighbour’s fence, no wary looks towards anyone wearing a turban – no paranoid stereotyping whatsoever – you’d know all too well when a band of burly yellow-bearded Vikings come marauding through your ‘hood. But my Odin do they throw the best parties – beer, mead, giant chunks of meat and regular rounds of pin the axe on the Englishman – unbeatable fun! Ghostbusters, Honey, I Shrunk The Kids, Spaceballs, The Flintstones… absolute classics I’m sure you’ll all agree. And what do they have in common? 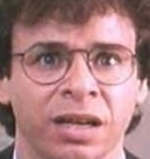 Rick Moranis. The diminutive Canadian, with his coke-bottle glasses and his lopsided grin were staples in the glory days of low-impact, family friendly comedy. Through the 80s and 90s he was the go-to guy for a laugh. One close-up of his confused, bespectacled mug and bang! Guaranteed entertainment! Unfortunately, he disappeared sometime after Honey we Shrunk Ourselves, which may offer some form of explanation. It’s a shame. The hype surrounding shark attacks and the like really struggles to live up to the statistics. According to statisticians from the Florida Museum of Natural History said that between 1580-2009, there were 2,251 shark attacks recorded worldwide – only 464 being fatal. That’s barely one per year – more people die from the hot water tap in their homes. 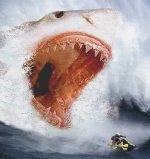 Enter Megalodon to shore up the numbers for shark-kind, and really give us a reason to stay out of the water. This ancient behemoth of a shark that lived between 25 and 2 million years ago. Some put the extinction of dinosaurs down to the New Mexico meteor impact. I put it down to Megalodon. It’s a 20-metre, 100-tonne underwater doomsday bringer, with teeth seven inches long and a badass name to boot – nobody messed with Megaladon… except maybe natural selection. Today’s 6-metre Great White Sharks may be the current aqua-predator pinup – but clone a couple of Megaldons and dump them in the ocean and see how brave those Jacques Cousteau-types really are.